A Warm Holiday Greeting from Jim and Julie’s Wabaskang camp. Yes, it’s already that time of year and Christmas is fast approaching. Julie and I want to thank all our guests for their continued patronage and friendships. Our continued goal is to make each one of you feel like family when you visit our camp. evening, the lights were on back-order when the snow arrived, so we decided to delay setting any poles and stringing wires until this coming spring, hopefully the new lighting will make it easier for our guests to come and go with their boats after dark. Our cabins all use propane for heating and cooking and we had the entire camp inspected to see if anything needed to be upgraded or changed, we are currently finalizing the last of the upgrades that will be completed this spring to have a very safe and reliable propane system throughout camp. With our 20th season fast approaching we know we will be very busy with other projects around camp, it seems the work is never done. Julie and I are both back at Kay and L Draperies now and getting back into our “Waverly” routines. 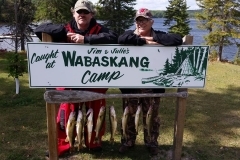 We had another great year of fishing at Wabaskang Camp. Our northern fishing really picked up after the water warmed and we saw some “monster “fish being caught and released. Most or our guests are using the usual lures such as spoons and spinner baits but the big baits like Sandcats, Suicks, Bulldogs, and Grandma Lures also caught many trophy fish. Let’s chat about the fish 40” and over. 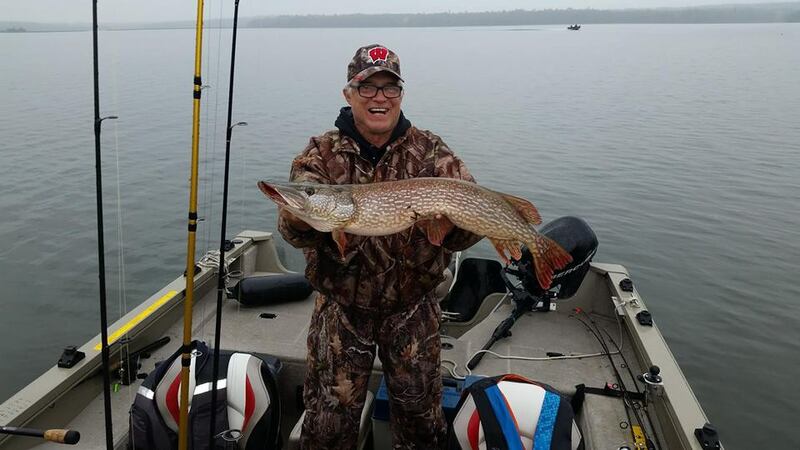 Pete Sauer released a giant 41 1/2” northern he caught while walleye fishing, he actually produced a picture of this fish, so we are actually believing him for once, Pete has always seemed a bit shady along with most of the fellas in his group. Cade Williams released a 40 1/2” fish, he easily out fished all the “has-beens” in his group. Rick Zender released a 40 1/4” northern he caught while speed trolling in Keynote Lake, just an average sized northern for the Zender gang. Kellie Schall knows how to throw a Sandcat, she released a 40 1/2” brute while fishing a weed bed in the big lake, her father Jeff can only imagine what it would be like to hook a big fish. Bodie Inselman released a 27” northern that you may think is no big deal, but that fish was almost as long as Bodie is tall, great job Bodie. Reid Lammers came to camp this season, he managed to catch a release a 41” brute that shows he does have a little bit of me in him. 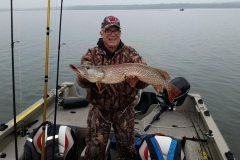 Marty Neihouser released a 42 1/2” northern, he still manages to catch big fish even though his boat is usually broke down and tied to the dock most of the time. Evan Neihouser released a 43” brute that was one of the biggest northern caught by our guests this season, seems big fish run in his family. Beau Thompson landed and released a 42” northern, he was fishing with “Big Mike” which makes his fish even more impressive. Ken Hartling released a 40 1/2” fish, his son Jason can only dream of such a fish. Kristy Lammers released a 40” fish, her best in a few seasons. Mike Lammers did do something special this season, he managed to catch and release a 44” monster northern, the biggest of the season and a great accomplishment for a fella that is on the outside looking in. 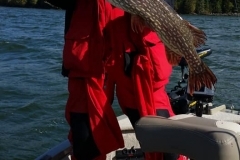 Tim Schaeffer released a 41” northern, that only took him 19 years to accomplish! Bev Harms released a gigantic 41 1/2” northern, she continues the yearly beat-down of her husband Allyn. Terri Roose was fishing with her husband Dan but still managed to catch and release a 42” trophy, Dan has finally come to the realization that watching is easier than doing. 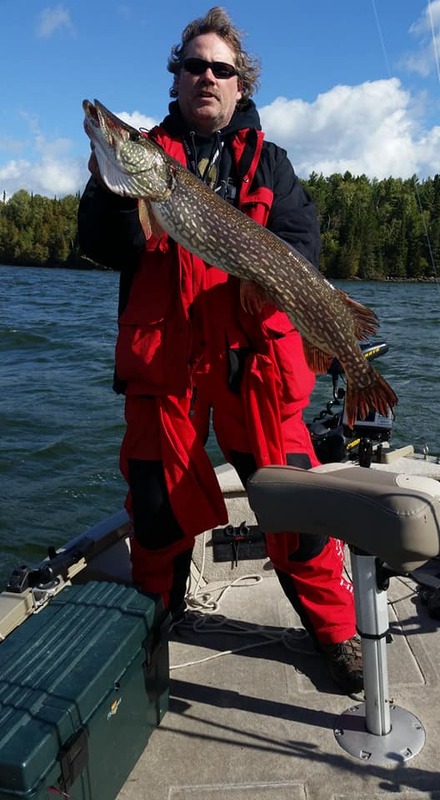 Kevin Holm was the man to beat when he was in camp, he caught a 42 3/4” pike that put him in “legend” status here at Wabaskang Camp. Kevin Reints released a 41” brute while fishing with “Big Mike”, move over “Big Mike” there is a new sheriff in town. As you can see, we had plenty of fish over 40” caught this season, next year we are hoping to see a fish 45” or bigger. 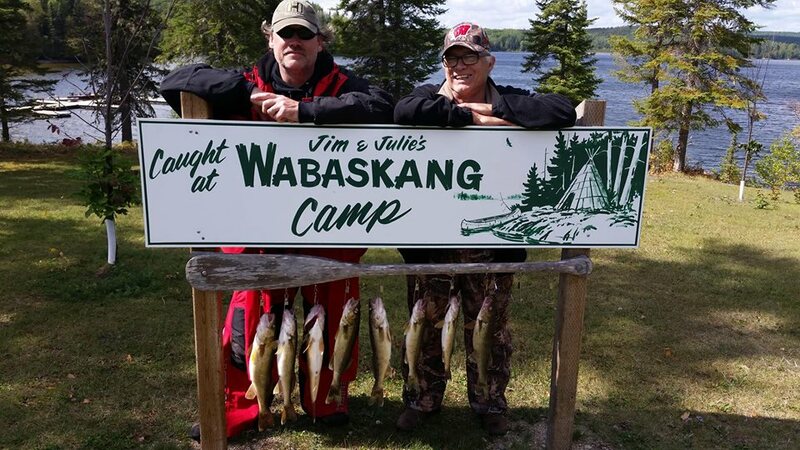 The walleye fishing here on Wabaskang is some of the best in Ontario, we see several year classes being caught by our guests. Here at Wabaskang Camp we encourage our guests to release their walleyes over 18” to ensure great fishing for years to come. The best technique here on Wabaskang Lake seems to be a jig and minnow or a Lindy Rig and minnow, our guests do have success with night crawlers, but minnows seem to be the number one bait. Trolling or vertical jigging is the way to go with crank baits and tube jigs also working when the fish are shallow or working deep weed edges. We saw many fish caught over 28” this season, here are just a few. My best buddy Harlan Kruse enjoys spending time here with me at camp, he released his personal best this season, a beautiful 29 1/2” walleye, not bad for a fella that brushes his teeth with anti-itch cream. Kim Schaeffer is quickly becoming a camp legend here at Wabaskang Camp. We have all heard that blood in the water attracts sharks and according to Kim urine in the water must attract walleyes, she managed to catch and release a 30 1/2” walleye while answering the call of mother-nature, don’t get any ideas Tim. Kristy Lammers released a 28” walleye, she should be the captain of “Big Mikes” boat not what’s his name. Marty Neihouser also released a 28” walleye, he only went through 200 gallons of marine fuel to do it. Beau Thompson is always on the leader board and he released a 28” walleye that keeps the fire burning, he gave buddy Rhett Lammers a major beat down all week long. Craig Mericle landed and released a 29” walleye, Craig should take his son little Jonny to the side and teach him a few things so maybe another Mericle can make the leader board. Reid Lammers had a good week, not only did he get to see me, but he released a 28” walleye that was bigger than anything his father “Big Mike” caught that week, maybe it’s time for Mike to pass the baton! I have to mention Cecilia Christensen’s 27 3/4” walleye she released while fishing deep water after dark with her father Casey “No Trailer Bearings” Christensen, (formerly Casey “Lightning” Christensen), great catch Cecilia! Tim “Walleye” Bruns was is the man to beat when he is in camp, he released a gigantic 30 1/4” walleye that his mom Venita said was a nice fish but she would have rather seen her grandson Bryce catch it, next time hand your pole to Bryce to keep the peace Tim. Nick Katsaropoulos released a 30” walleye he caught within sight of our dock, no need to go far to find big fish if you know what you are doing, great catch Nick. Dale Wilson released a 28” walleye, he keeps the “boys vs the girls” trophy in the trophy case another year. Greg Stankewicz caught and released a 28” beauty, Greg had a great teacher—-Nancy. Wayne Eben made his first trip to camp a memorable one, he landed a 28” beauty. Randy Cook released a 28 3/4” walleye, he has been a camp regular since the beginning of time and his wife Michelle does not like losing to her husband Randy, probably was a quiet ride back to Iowa, just kidding Michelle is never at a loss for words. Mark Kleinschmidt landed a 28” walleye, keeps his brother Craig quiet until next season. Chris Tucker released a prehistoric 30” walleye that made the ride down to Keynote worth it, he has plenty of great memories from that lake. Shane Arthur released a 28 1/4” walleye that impressed even his buddy Brian, lets shoot for a 30” fish next season Shane. Bass fishing continues to impress our guests. The bass are found almost everywhere in the lake and the average size being caught and released is getting bigger and bigger each season. The most popular technique used by my guests varies depending on the time of the season, Spring is the best time for soft bodied baits usually the smaller the better, Summer is top-water time along the rocky shorelines and weed lines, Fall is the time to go deep and use jigs with a minnow or crawler. We had many fish released over 18”, here are just a few. 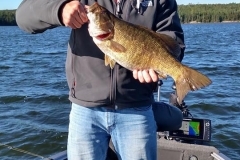 Jim Fucile released a chunky 19” fish, Scott Johnston released a gigantic 20 1/4” bass, Brandon Heuer released plenty of fish over 18” this season, he is slowly catching on to the bass fishing here on Wabaskang lake, give him a few more years and look out. Tyler Carrillo released a 19 1/2” beast, easily the biggest he has caught here at camp. Kevin Johnson released over 100 bass while he was here at camp, his biggest was a 19 1/4” brute, he will be back next season looking for that 22” bass that is surely out there. 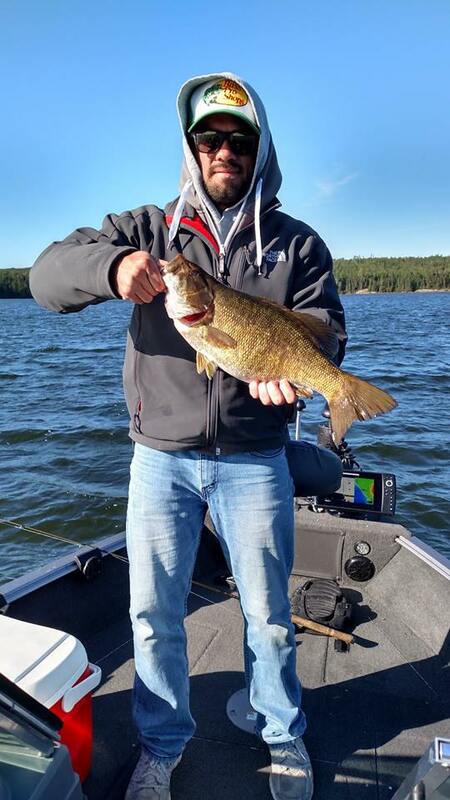 Chandler Seehusen released two 19” bass, Clint Seehusen crushed Chandlers dream of being the big winner of the week when he landed and released a 19 1/2” bass, what are fathers for? Sam Ulrich is a bass fisher man from Missouri, he released a 19 1/2” fish that was easily the biggest in his group, not bad for a guy with a bad back. Zayden and Bodie Inselman caught plenty of big bass right from our dock, the biggest being 19”, they made grandpa Charlie proud. Nick Katsaropoulus released his 19” bass and it was his biggest ever. Evan Neihouser released a 19 1/4” brute, made papa Marty proud. Reid Lammers stumbled into a 19 1/4” bass, his best in many seasons but still not up to my standards for a nephew. Doug Katzung landed a 19” bass that is going on the wall, nice catch Doug. Brianna Luecke released a 19” bass, she always out-fishes husband Paul but that’s not too hard to do. Kim Schaeffer caught and released a 19” fish, she is becoming the one to watch out for when she is in camp. Ben Finfrock was new to camp but his 19” bass was top dog until Kyle McNeil came along and released a 19 3/8” brute that shows even a “city kid” can catch big fish. Only a handful of trout were caught this season. Most of our guests fish deep water with spoons that are blue and silver in color. Dave Wendlandt and Dennis Earney shared the experience of catching a 28” trout but Dennis’s daughter Ashlyn caught one just a little bit bigger, a nice 28 3/4” trout, great job Ashlyn. Our guests continue to catch crappies, mostly in late May and all of June. The best place to look for the crappies is down in Keynote Lake, we had many guests that caught their limits with some fish over 15”. Another season has come and gone, we are looking forward to seeing all of you again next year. Please remember to bring your Ontario Outdoors Card even if it has expired to speed up the process of issuing you a new license. Now is the time to check your passport and make sure it has not expired or wont before your trip to camp. For those of you receiving reservation forms please remember to return it to us with your deposit before December 15th, we have guests waiting to find out about any possible openings we may have, if you are not planning on making the trip to camp this season please e-mail us or return your reservation form noting your cancellation so we may offer your cabin to another party. Thanks again to all our wonderful guests, we look forward to seeing you all again next season.